This course gives you a good understanding on Design Thinking and helps you to start practicing it in your day to day life. This subject will be especially useful for Product & Service Designers, Business Analysts, Innovation Programme Managers, Solution Designers and Architects… and basically, anybody wanting to undertake a project or innovation differently – thinking beyond the obvious. Introduction to Design Thinking. You are introduced to the origin and eveolution of Design Thinking. A few different definitions are discussed. The main difference of this methodology versus some others is explained. 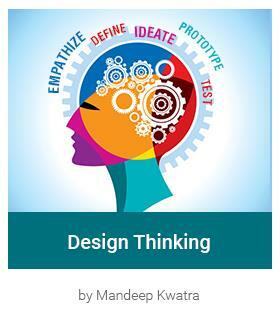 You will be introduced to the phases of Design Thinking. And finally, we will define a case a practical challenge that we will work on in the subsequent sessions / levels. You will learn what the Inspire phase involves - it's various steps / stages; how do we practically go about executing this important phase of Observing and Forming Insights. You will be given tips along the way on the do's and don'ts. You will take Insights created in the earlier phase through the journey of opportunity identification to brainstorming ideas. We will see how good ideas can be generated and techniques to analyse the same. In this section, you will put our ideas into practice. You will learn storyboarding and from this, identifying experiment (s) that can test the idea. You will be exposed to the concept of MVP in the context of Design Thinking. Finally, we will recap the overall session through a multiple choice question quiz. As you go along, we will recap key concepts of Design Thinking linking it to the story / case we developed through the course.